Eucerin Intensive is a moisturising lotion which hydrates dry skin. It locks in moisture by replenishing the protective layer of oils on the surface of the skin. How does Eucerin Intensive work? How do I use Eucerin Intensive? Dry skin develops when the natural oils (lipids) within the outermost layer of the skin (stratum corneum) are diminished. The oils act as an impermeable protective layer which prevents the water from escaping the skin, keeping the skin hydrated. While dry skin can develop as we get older, it can also be caused by washing for too long or too often, using soaps which contain irritants like perfumes, or as a side effect of other medicines. Aesthetically, dry skin can cause the affected areas of skin to appear red, inflamed, pale, flaky and scaly. These patches of skin may be itchy and sensitive to the touch. In some cases, the skin may break open which not only causes pain and further irritation, but opens the skin to infections. This is common in the case of cracked heels. Cracked heels happen when the skin around the heel dries out. As the skin stretches and moves when you walk, the brittle skin breaks and cracks. This can make daily activities such as walking, running or simply standing painful. In studies, Eucerin Intensive was shown to be effective at rehydrating eczema prone skin to normal levels when used twice daily for 7 days. Subjects reported a noticeable improvement in their eczema after 4 weeks of continuous use. Eucerin Intensive contains a substance called urea. When applied to the skin, urea disperses into the skin where it softens and loosens the hard skin. The active ingredient (urea) is combined with a moisturiser which provides a protective layer of oil on the skins surface. When used regularly, Eucerin Intensive can keep the skin hydrated for longer and replenish the natural protective barrier which keeps moisture from escaping. Eucerin Intensive is a topical lotion which is applied directly to affected areas of skin. Wash and dry the area of skin you will be applying the lotion to. Apply a small amount of the lotion to your skin and gently massage the lotion until it is completely absorbed by your skin. How often should I apply Eucerin Intensive? Eucerin Intensive should be applied twice daily to affected areas for the best results. Do not apply the lotion to broken or inflamed skin. All medicines carry the risk of side effects, though not everyone will get them. It's important to be aware of any risks posed by the medication you are taking or using. Be vigilant of side effects and don't hesitate to contact your doctor or a pharmacist for advice. Side effects of Eucerin Intensive are rare and are usually the sign of hypersensitivity to one or more of the ingredients. If you experience any of the side effects listed above, stop using Eucerin Intensive and speak to your doctor immediately. Who should not use Eucerin Intensive? Do not use Eucerin Intensive if you are allergic to any of the ingredients listed on the label. Can I use Eucerin Intensive while pregnant or breastfeeding? 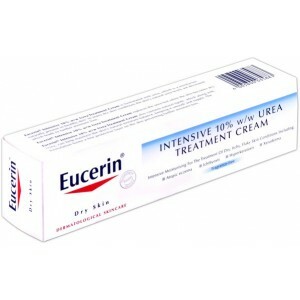 It is safe to use Eucerin Intensive while pregnant. Breastfeeding mothers should take caution if they will be using Eucerin Intensive on or around their breasts. Wipe away any residual lotion before feeding your child. What should I do if I forget to use Eucerin Intensive? If you forget to apply your Eucerin Intensive lotion, apply it as soon as you remember and continue to use it as normal. Don't use more Eucerin Intensive to make up for the missed dose. What happens if I apply too much Eucerin Intensive? Applying more Eucerin Intensive than required is unlikely to cause any harm. If you accidentally apply more Eucerin Intensive lotion than you need, simply wipe away the excess with a dry tissue and safely discard it. If you are not sure how much Eucerin Intensive you should use, speak to your doctor or pharmacist for advice. The amount you use will be dependant on the size of the affected area of the skin. When Pregnant: Eucerin Intensive is safe to use while pregnant. When Breastfeeding: Eucerin Intensive is safe to use while breastfeeding.